I can’t believe it’s already after Labor Day and summer is unofficially over. Next week it will be officially over with the arrival of the Autumn Equinox. Howard will continue to eat corn until the last sweet ear. We also starting cutting kernels off of cobs and freezing for the winter. This Sunday’s Globe magazine has some amazing-looking corn soup recipes, so I see one of those in our future eating. I can tell the days for summer tomatoes are numbered, but I’m making the most of them. I made two tasty tomato dishes this week, both worthy of sharing. First was a spicy tomato pie. It made a great lunch, both fresh out of the oven, and reheated at work. The pie sandwiches fresh tomatoes between a peppery biscuit dough. The tomatoes are covered with grated cheese and a spicy mayonnaise. Howard found it a little too spicy, but I loved it! 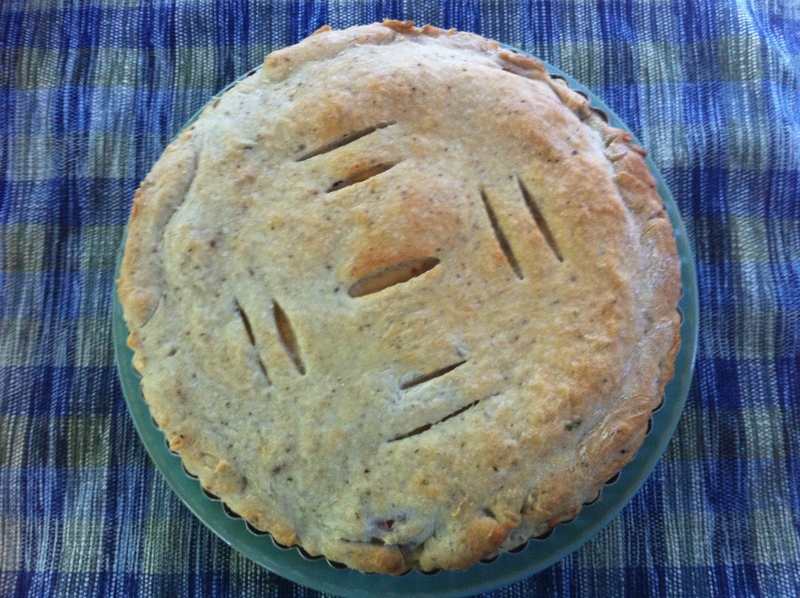 I used a 9-inch tart pan with a removable bottom, so my pie only had two layers of tomatoes. If I had used a regular pie pan, which would have been deeper, I could have had more layers. To make the biscuit crust: Mix together the flour, pepper, salt and baking powder. With your fingers, quickly work the butter into the flour until it is the consistency of coarse-grain sand. Make a well in the center of the flour mixture and pour the milk into the well. Using a fork, mix quickly, until the dough comes together. It will be soft and sticky. Turn onto a WELL-floured surface. Knead the dough for about 30 seconds. Then let it rest for 10 minutes. Preheat the oven to 350F. Cut the dough in half. Roll our one half to fit the bottom of a 9-inch tart pan with a removable bottom. Line the pan with the dough. Cover the pie dough in the pan with a layer of tomato slices. Sprinkle with a little kosher salt, and some chopped cilantro. Repeat with another layer. Top the tomatoes with the grated cheese. Thin the mayonnaise with the lime juice and whisk in the chopped chipotle. Spread the mayonnaise mixture over the surface of the pie. Roll out the other half of the dough and place over the top of the pie, pinching the edges of the top and bottom crust to seal. Cut some slits to allow the steam to escape. If you want to, brush the surface with cream or an egg wash.
Bake until the pie is hot all the way through and the crust is golden, about 25 minutes. Let the pie rest for 15 minutes before serving. Loosen the edges of the tart pan and remove the outside piece (leaving the pie on the base). Cut into wedges to serve. I also went to a potluck dinner this week, hosted by Teresa from Farm Share Stories Farm Share Stories . She invited the food bloggers who participated in the Loving Local blogathon a few weeks ago to her home. My contribution to the bountiful table of good food was a new bread salad I concocted. The salad was a sort of deconstructed pesto bread salad, with a vivid green basil dressing. I have a new batch of croutons waiting to be made into this salad again for dinner tonight. This time I’m going to try adding a clove of garlic to the dressing to make it more pesto-y. To make the dressing, combine all the ingredients in the blender and puree until smooth. To make the salad, place croutons and remaining ingredients in a very large bowl. Toss gently to combine. Add the dressing and toss to coat all ingredients well. Let the salad sit about 10 minutes before serving so the bread can soften up a bit. You can prepare the ingredients up to a day ahead of time. Don’t combine the ingredients more than an hour before serving because the salad will get too soggy. Leftovers don’t keep that well. 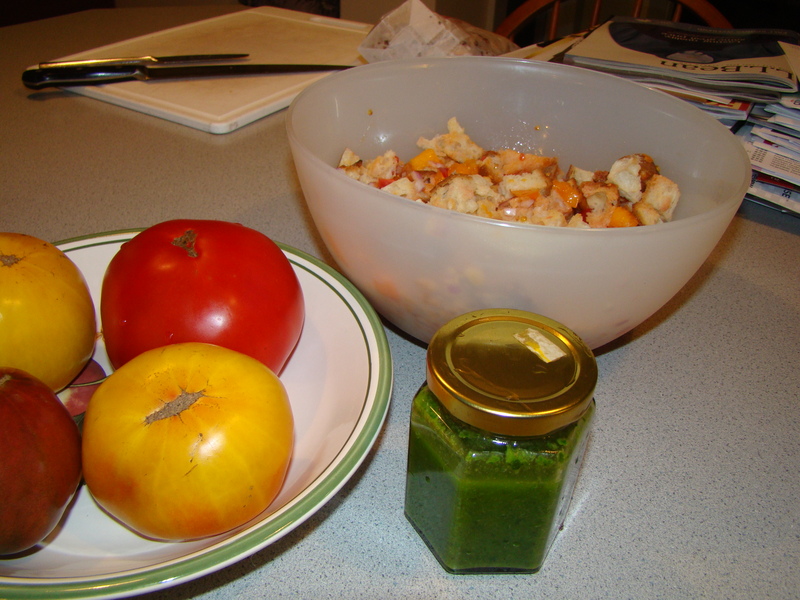 Posted on 19 September 2010, in tomatoes and tagged salad, savory pie, tomatoes. Bookmark the permalink. Leave a comment.